Virtually every company has chemicals, either in storage, being used, or awaiting disposal. There are an estimated 650,000 existing chemical products, and hundreds of new ones being introduced annually. These chemicals pose a wide range of health hazards, from mild irritation, to possible death. The way your employees handle these chemicals can make a huge difference in their safety and the safety of your facility. The KellerOnline® Safety Management Tool provides the tools you need to build and maintain a comprehensive and compliant Hazard Communication Program. These tools will help you maintain your chemical inventory, search for safety data sheets, identify chemicals regulated by various agencies, create compliant HazCom labels, and produce reports for effective chemical management. KellerOnline can also help with training and written safety plans to ensure that your employees know how to handle the chemcials used in your facility. Get the tools you need for effective Chemical Management! "...Chemical inventory and updating safety data sheets is very time consuming but KellerOnline makes it easy to search for the information I need." To comply with the Hazard Communication regulations, employers need to keep records on which chemicals are (or were) in use so that any employee injuries and illnesses resulting from chemical exposure are treated properly. For exposed employees, a list of what chemicals were used, where, and when, must be kept for at least 30 years. The chemical recordkeeping tool in the KellerOnline® Safety Management Tool will help you gather, store, and report all the vital information for each chemical in your inventory. Many different agencies regulate certain chemicals. Each agency has its own set of criteria as to what they regulate and how they regulate it. In addition, there is a confusing array of multiple names for each chemical. OSHA may call it one name, EPA another. 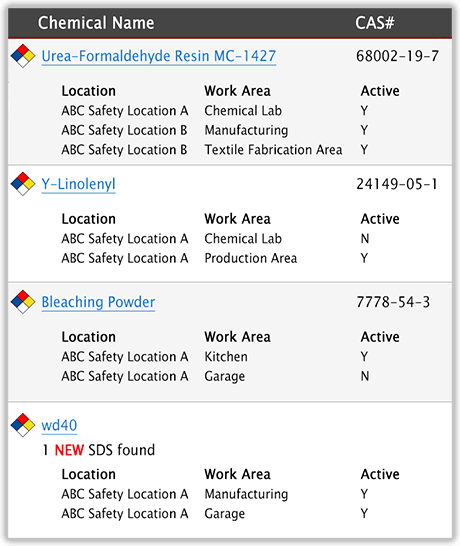 With the KellerOnline® Safety Management Tool, you can see which agencies list your chemical or it’s synonym. 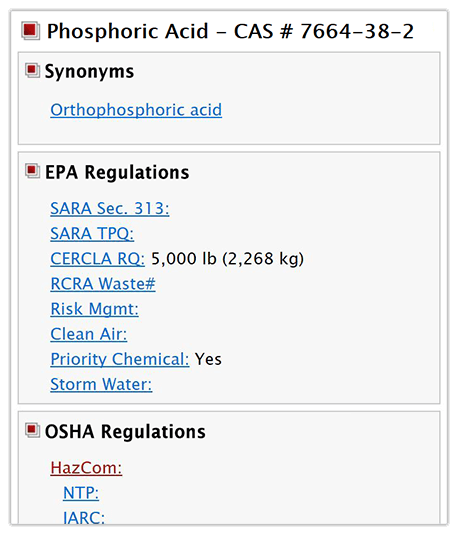 Find which regulations your chemical is listed under for EPA, OSHA, and DOT. 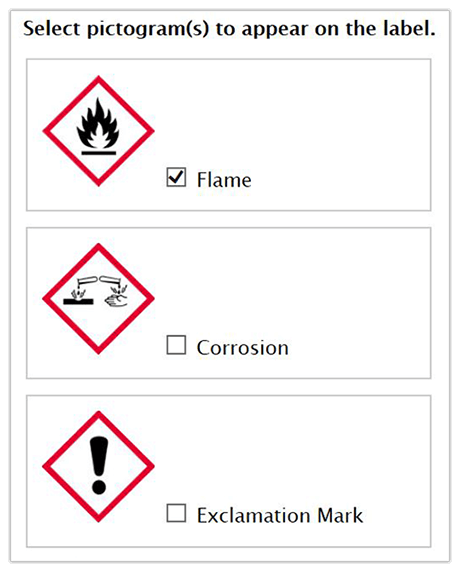 KellerOnline's HazCom Labeling Assistant will help you create compliant in-plant labels with its built-in guidance for generating GHS, NFPA, HMIS, and HMIS III labels. The tool will walk you through the steps needed to determine what hazard rating, or warning, should be displayed on containers of hazardous chemicals. Have you ever had problems finding a Safety Data Sheet for one of the chemicals at your facility? Partnering with MSDSonline®, the KellerOnline® Safety Management Tool features a simple search tool to help you find an SDS for the chemicals in your facility. 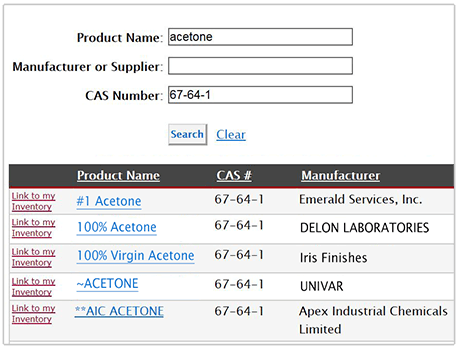 Search for chemical’s SDS by product name, manufacturer or supplier, and/or CAS#. Link your SDS to a chemical record and SDSs will be monitored for version updates. New SDSs are automatically linked to the chemical record. Access all linked SDSs within “My SDS Binders.” Print your SDS binders, including an index and cover page. Let KellerOnline help you build and maintain your comprehensive and compliant Hazard Communication Program, sign up for a free trial today!